This kugel is my answer to that icky-sticky sweet potato casserole that is so popular in some Thanksgiving circles. I prefer this dish mainly because it does not have marshmallow cream along the top. 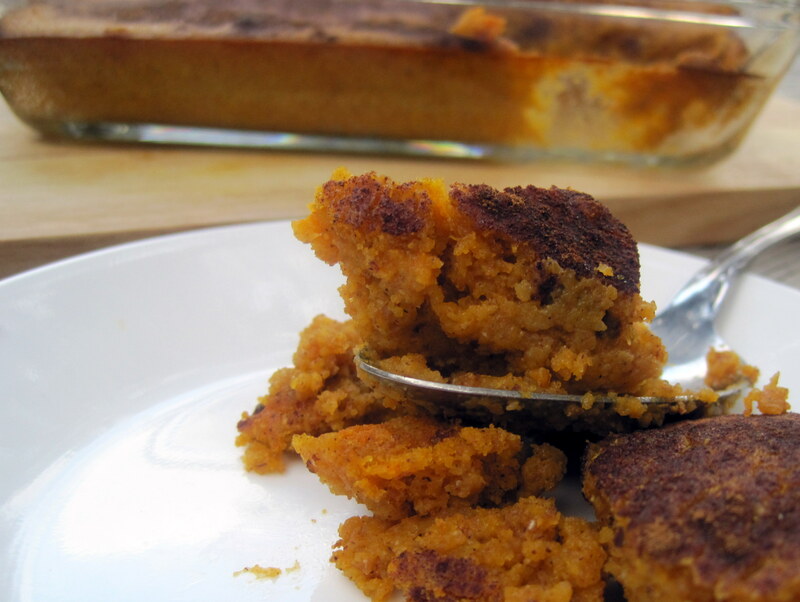 However, there are other advantages: this kugel has a firmer texture than sweet potato casserole, it is much easier to prepare, and it’s healthier. I adapted this recipe from one published on Allrecipes.com, using fresh squash puree instead of frozen cubes, substituting wheat flour for all-purpose, and reducing the sugar. On Thursday I plan to serve this as a side dish during the main meal, garnished with fresh sage chiffonade. I’ll cut the cinnamon in that version of the recipe down to one teaspoon sprinkled on top. Need help preparing the squash puree? Step-by-step instructions are here. Preheat oven to 350 degrees and grease a 6×9 inch pan with butter, vegetable oil, or cooking spray. 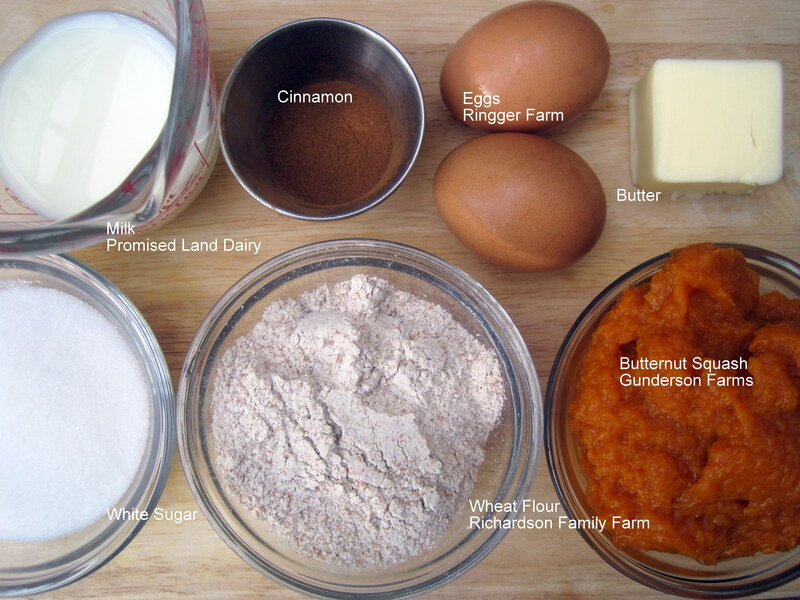 In a medium mixing bowl, combine squash puree, eggs, milk, flour, sugar, melted butter and about half the cinnamon. Stir until well combined. Pour mixture into prepared pan and sprinkle with remaining cinnamon. Bake for 30 minutes, until kugel is firm and golden brown. Serve warm or at room temperature. I really like this cold for breakfast the next day, too. This entry was posted in Breakfast, Desserts, Dietary Restrictions, Recipes, Sides & Appetizers, Vegetables, Vegetarian and tagged Butternut squash, casserole, Cinnamon, Cooking, Eggs, kugel, Thanksgiving, vegetarian. Bookmark the permalink. Yum! 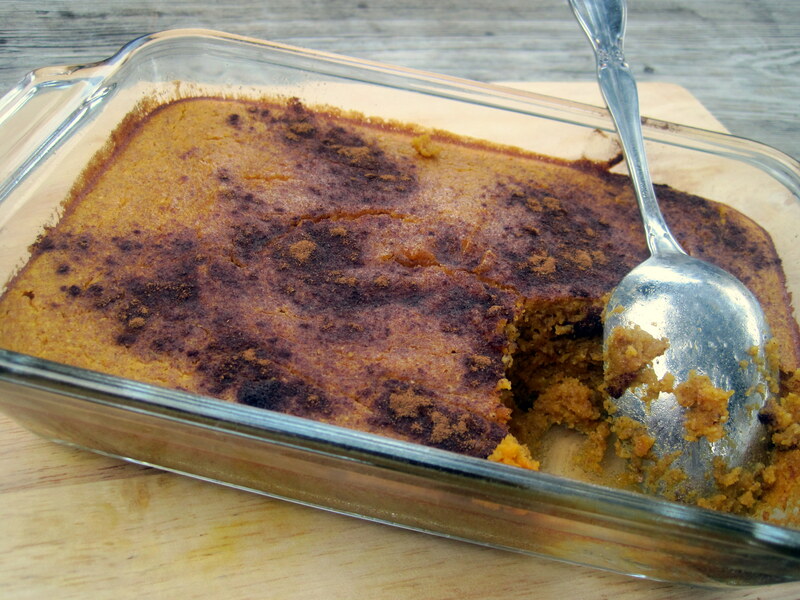 I do not like any sweet side dishes, so the “normal” sweet potato casserole is not something I would go for. This looks great! Oh, that sounds nice. I like how simple it is, also. I’m not a big fan of the sweet potato casserole covered in marshmallows, either. My mom is making little sweet potato pie-tarts and I was wondering if I should include another sweet potato side in addition. If I do, this is a great option for me because my table is becoming monstrous. Wow this looks amazing. I’m definitely stealing this for my Thanksgiving. I grew up with a Jewish mother who made all sorts of kugel but never butternut squash so I’ll be sure to pass the recipe along. Thanks! Thanks so much for the kind comments, you guys! Thanks for the great recipe! I’m definitely going to make this for Tgiving today. Just a little note- though I saw the eggs in the photo and directions, you might want to add the eggs to the ingredient list. Yeeks! Thanks so much for catching that, Val!